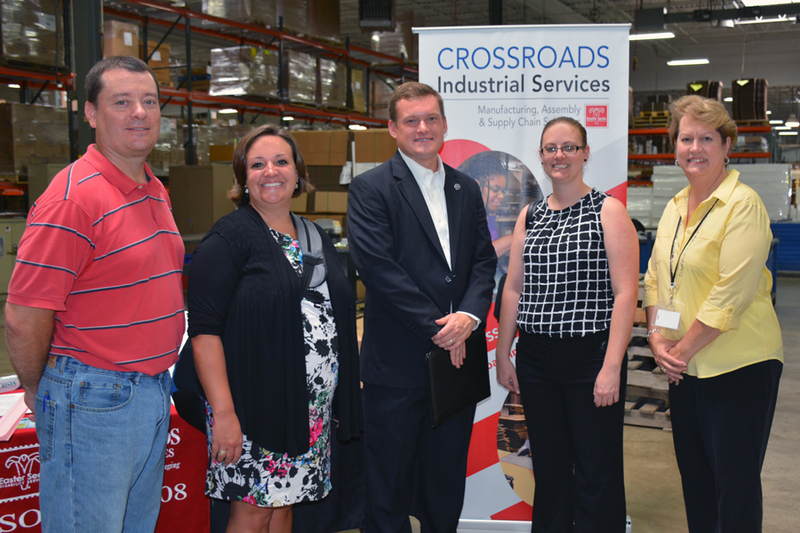 INARF member and State Use employment provider Easter Seals Crossroads had multiple state representatives visit its Crossroads Industrial Services division. The representatives toured its production facility where nearly 85 percent of its workers are individuals with disabilities. INARF was very proud to be part of this advocacy accomplishment. Below is the full press release sent by Crossroads Industrial Services. Crossroads Industrial Services, a division of Easter Seals Crossroads, operates on the far eastside of Indianapolis in a 68,000 square foot production facility. Almost everything is possible at this manufacturing, supply chain management, fabrication, assembly, packaging and scanning facility that is an ISO 9001:2008 registered business that generates revenue for Easter Seals Crossroads. Solid, innovative management and the employees are the strength behind the facility where approximately 85 percent of the workers are individuals with disabilities or special needs. Crossroads Industrial Services can turn ideas into realities for start-up businesses, and it can act as a virtual factory for organizations that need to put their resources into growing their businesses. As part of the ongoing commitment to develop new customers, Crossroads Industrial Services has been spreading the word about its capabilities through an awareness campaign for local and state representatives. On August 21, Indiana State Representative Robin Shackleford from District 98 toured the facility to learn more about its current jobs and future capabilities. She specifically wanted to know more about what we do, how we do it and who does it. She greeted and spoke with current employees to gain an understanding of the commitment of the employees. Thanks for taking the time to provide a wonderful and informative business tour. During my visit, I couldn’t help but to appreciate all the efforts Crossroads Industrial Services is doing to cultivate opportunities for Hoosier adults and children with disabilities. On September 3, Indiana State Representative Donna Schaibley from District 24 made a visit to Crossroads Industrial Services. She learned of the agency through a Carmel Rotary Club meeting and wanted to see for herself how the facility operates. She toured the factory and spoke with employees to get a feel for the work ethic of the agency and was very impressed. She will be a great advocate in the Indiana House of Representatives in her support of employment for individuals with disabilities and special needs. On September 8, Brandon Herget – Senator Joe Donnelly’s Indiana Regional Office Director – visited the agency along with representatives from INARF, Katy Stafford-Cunningham (VP Public Policy) and Sarah Chestnut (Public Policy Coordinator). The group specifically wanted to learn more about Crossroads Industrial Services’ commitment to employment for persons with disabilities and special needs. Of particular interest was the use of the many employees who come to and from work via our city’s transit system. Many of our employees use the fixed route bus system as well as the para-transit, door-to-door service. Senator Donnelly has been a great supporter of creating opportunities for individuals with special needs to thrive in the workplace. Senator Donnelly is included as one of our nation’s Senators and Representatives that have earned the distinction of being named a Source America Champion. Source America is an organization that was created thru legislation in the early 1970’s to help create workplace opportunities for individuals with special needs. Crossroads Industrial Services is a proud member of Source America, primarily through our work in manufacturing Combat Identification Panels for the US Army and USMC. Upon completion of the visit on September 8, Katy Stafford-Cunningham said, “What an impressive operation you have.” We value and appreciate INARF’s support in advocating for supporting additional exposure from our senators, congressmen and representatives. Crossroads Industrial Services provides solutions for businesses in our community and makes a proud statement with its work ethic and support of persons with disabilities and special needs. With the support and involvement from our State’s representatives, we are ready and able to spread the word about our role as an industry leader. (Left to Right) Greg Roberts, Product Manager at Crossroads Industrial Services, Katy Stafford-Cunningham, Vice-President/Public Policy at INARF, Brandon Herget, Senator Joe Donnelly’s Indiana Regional Office Director, Sarah Chestnut, Public Policy Coordinator at INARF, Anne Traub, Human Resources Manager at Crossroad Industrial Services.